Colder’s PMC Series couplings have a 1/8" flow are used in a wide variety of general-purpose applications. 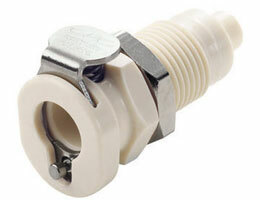 Featuring the CPC thumb latch, the PMC is easier to use than ball-and-sleeve connector designs. One-hand connection and disconnection and integral terminations make the PMC the choice for ease of use and manufacture.